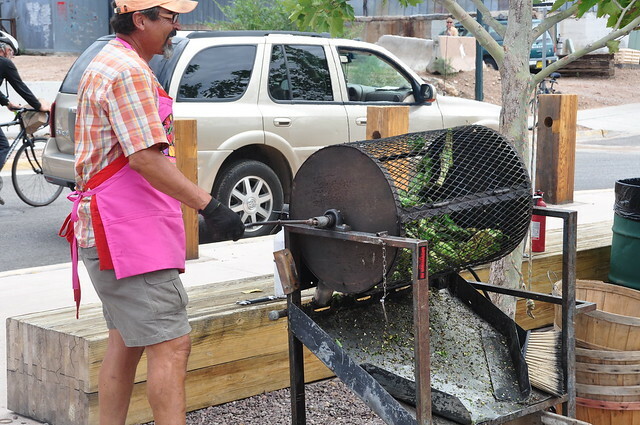 Here in the Dona Ana county of New Mexico, we are awash in the freshly picked and roasted chiles for which the area is famous among chileheads. There has been extensive flooding in Hatch, the designated epicenter of the chile, recently, and no one is quite sure how it's going to affect the chile crop, which is being harvested as I type, though at every supermarket or small market I look I see the huge 30 pound bags of fresh chiles, and people standing in line awaiting their turn at the roasters--huge wrought-iron open-air barrels that rotate above a noisy propane flame. If chiles are your thing and youv'e got a little cash to spare, I encourage you to order some to be sent to your home. I can't give any specifics other than to suggest Googling sites, as I don't have to go through the mail for my chile-fix, though I've heard Joe Lujan's (of Las Cruces) farm ships, and many places in Hatch will ship, too. You should specificy your chile heat preference when ordering, I would think. Anyways--just letting you know that there's a good thing to be got in this part of the country right now. I am very jealous, as good, hot, genuine Hatch Chiles rarely make it to this part of the world...unless someone has a local source. stevez wrote: I am very jealous, as good, hot, genuine Hatch Chiles rarely make it to this part of the world...unless someone has a local source. I've bought Hatch Chiles from Da Gift Basket for the past couple of years with great success. I have several friends who use them as their source too. I was very pleasantly surprised to see an enormous display of enormous fresh Hatch chiles for sale, hot and mild, at the local Price Chopper here in Kansas City. Additionally, they were selling big plastic tubs of freshly (still warm) roasted chilis, of which I picked up a couple pounds and am now looking for ways to use them. Does anyone know how long I should expect them to be available? ParkerS wrote: Here in the Dona Ana county of New Mexico, we are awash in the freshly picked and roasted chiles for which the area is famous among chileheads. I've never seen so many different kind of beautiful chiles as I have so far this year. We did a little tasting party the other day with roasted green Hatch, Big Jims, Improved Alcades, Poblanos, Sishitos, and Padrones. For those who like their mouth to burn, the Alcaldes were the favorite. The Big Jims proved most popular for those who prefer a milder chile. All were great and were grown on NM farms but word is that an increasing number of fresh chiles are being imported from Mexico. Bruce, thanks for the suggestion of the Gift Basket. I'll have to order ASAP. Every thread needs its dissenter, so I guess I'll volunteer. I have never understood the popularity Hatch chiles. I find the taste to be bland to the point of being grocery-store-generic. It's not unpleasant or off-putting in any way, it's simply that I find nothing special, nothing worthy about it. Flavor (or character) is lacking and it's a one-note taste. Now, perhaps I've had bad exemplars. Perhaps it's time to try some again. But this is an opinion based on more than one tasting and my experience, at those times when I think perhaps I'm being unfair and I decide to try it again, is always the same. For more years than I can recall, I have bought my "go-to" chile from The Chile Shop in Santa Fe. I can't seem to find it anywhere else. I love it. It's called Dixon Medium Hot and, although not particularly hot, it has a wonderful depth of flavor and is extremely well-balanced. (Dixon, for the curious, is a small town on the "low" road from Santa Fe to Taos.) I generally use it as a base--sometimes alone, but more often in combination with something like guajillo, ancho, or cascabel. Dixon is "common" enough to be found fairly easily on the web, but most articles that refer to it do so in passing. It's not, as I said, an easy chile to find--at least under that name. I have seen one reference to the "fact" that it is another name for the Chimayo, but don't know that for a fact. My unreliable memory tells me that The Chile Shop once sold both Dixon and Chimayo, so I hesitate. There is also an article on "The Wonders of New Mexico Chile" by a professor of agronomy at New Mexico State listing the two separately. However, if they are the same, that would account for the difficulty of finding it, for the Chimayo is produced in small quantities and it's almost all eaten locally. I have posted on the Dixon chile previously in a fascinating thread that began with a recipe from Antonius entitled "Comida en Colorado." My post there also linked to a "Varieties Database" that includes both the Dixon and the Chimayo. For those interested in chiles in general, I recommend it. And for those who persist in Hatchophilia, ¡buen provecho! Gypsy Boy wrote: Dixon Medium Hot and, although not particularly hot, it has a wonderful depth of flavor and is extremely well-balanced. I've been told that the Improved Alcalde and the Dixon chile are the same, but one can never be sure with chiles. The farm I buy them from is in Dixon. I don't know about the Improved Alcalde, though I am pleased to find another user of Dixon chiles. I wonder how you would compare Dixon and Hatch (and whether you've heard the Dixon/Chimayo connection made before)? I live in Michigan but discovered The Chile Shop in Santa Fe almost two decades ago and have been buying their Dixon Medium for that whole time. It has the most remarkable flavor and color and keeps very well in an airtight container in the freezer. TCS prices are reasonable and I have never been disappointed in their product or service. I have tried the Chimayo from them, and in my opinion, it is just hot and flat in flavor. I hesitate to praise the Dixon too much, since I don't know how much of it is produced each year. If you have never experienced this remarkable NM chile, get on their web site and order a half pound. You will be addicted for life. This red chile is what it is all about. I use it in my killer red enchilada sauce, and love it sprinkled on popcorn. Another little secret - URFA pepper from Turkey. If you haven't had any of this remarkable smokey, steamed deep purple flaked pepper -- well we eat it on everything and by it by the pound from Kalystan's in NYC for something like $12.00. It looks like pipe tobacco, but the depth and complexity of the flavor of this medium heat pepper is absolutely remarkable. Anybody know of a source for these locally? I've noticed the word "Hatch" being strewn around haphazardly lately. 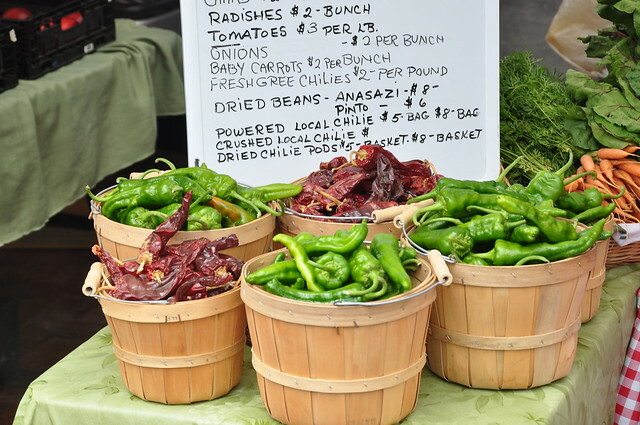 Are you looking for the green/ red Anaheim chiles grown specifically in the Hatch Valley, or, are you looking for Anaheim peppers grown anywhere? kuhdo wrote: Anybody know of a source for these locally? No idea where to find actual fresh roasted Hatch chiles locally, but made a tasty Green Chile Cheeseburger today using a mix of anaheim, poblano and serrano. The Jewel in Galewood had 2 crates of Hatch chilies sitting on the floor of the produce section earlier this week. I was quite surprised to see them, and I did wonder, given their "big relief price cut" marketing is a total crock, if they were indeed real hatch chilies. Jewel on Roscoe/Western...clearly from Mexico. At least the price is solid...Strack & Van Til's Anaheim Peppers were $3.99/lb! We once drove to Hatch, N.M. to meet one of the country's biggest chile farmers, Jim Lytle. The big Jim chile was named in honor of his Dad. He was a very entertaining man, told us how he once lost a half a million dollars worth of cotton in ten minutes during a hail storm. The directions were great, turn right at the Dairy Queen and then go down two farms. I suspect the chiles sold at Jewel don't necessarily come from Hatch, specifically, but are some sort of generic New Mexican type chile pepper. 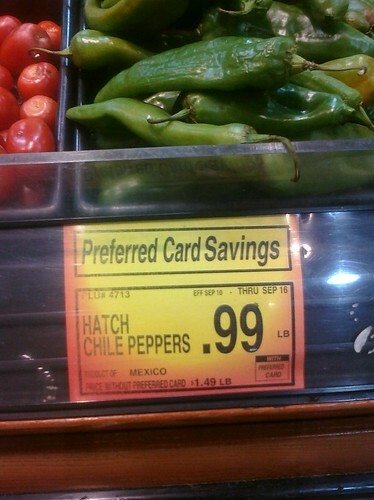 Yet so many chiles grow around Hatch, maybe that would be the default for the address of these peppers. Thanks for the input. The Mexican Anaheims seem plentiful everywhere (got some on Maxwell street recently) but aren't nearly as tasty (or hot) as the real deal Hatch peppers. Finally gave in and ordered some by mail. I suspect the chiles sold at Jewel don't necessarily come from Hatch, specifically, but are some sort of generic New Mexican type chile pepper. I guess the tip-off would be the words "PRODUCT OF MEXICO" right under the price. . .
Folks, it's just a good-sized Anaheim type of chile. Decent price, but the chiles look old and shopworn - and it's clearly a case of blatantly false advertising. Does anyone have a local retail resource for frozen red chiles--possibly Hatch, from NM? Interesting recipe in Chicago, Trib. 12-22. Looking to buy THESE chilies locally. Any help???? NOT NOT WANT CHILIES FROM MEXICO. If there is not a source mentioned, the Anaheim peppers you can get around town are the closest cousin to an NM green. Hatch chiles are big business, by the way, and you can have them shipped to you roasted/ frozen, sometimes fresh. Extremely rare will you find folks who know what you are talking about outside of northern Texas, Colorado, NM, and Az. You can find canned versions fo them in most grocery stores, but I wouldn't touch em with a ten foot pole. If you resort to mail order, search for chile or chiles, not chilies. If someone does know of a place to buy NM green chile or Hatch green chile in the Chi area, I betcha I get there before you do. Ordered to jars of each from New Mexico Green Chilies. walter wade wrote: Ordered to jars of each from New Mexico Green Chilies. Currently looking for a local Chicago source for (hopefully hot) fresh Hatch green chiles. It can be a wholesale produce supplier for a box. I saw them in cans about two weeks ago at the Trader Joe's at Diversey & Clark, they were stacked over the frozen foods I looked at the can and they were labeled as being from New Mexico. I didn't get any so I don't know if they're any good. Sorry, I don't know. I was (probably just like you,) thinking my prayers had been answered and the thread had been bumped with a local source. I wonder if there are enough people around here looking for a sizeable enough fix of green or red to support someone figuring out costs, and setting up shop somewhere with a roaster in a parking lot (or back yard) for a few days. I know I'd pay. If you do mail-order, please share what site. My batch from last year (using Wisonsin grown anaheims, and big jims) was pitiful. I have about three quarts of green in the freezer still. Normally, I have to ration it out, and it never lasts through winter. I've decided I'm mail ordering this year if nothing else. I know this is kind of mean to post, but through dumb luck I happened to be in Santa Fe this past weekend during chile season (dumb luck in the sense that I did not plan my trip around this). 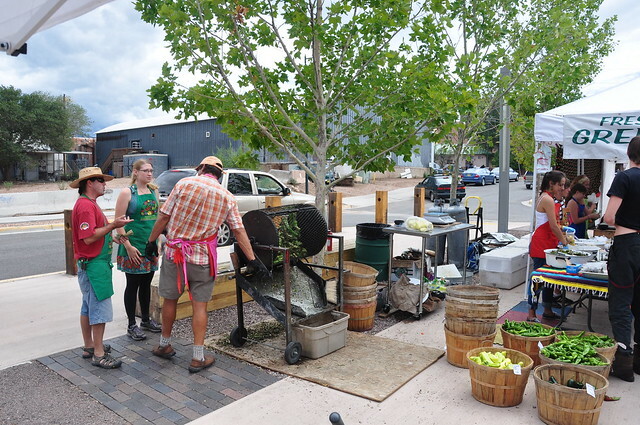 Man, the smell of chiles roasting at the farmer's market was something I will not soon forget. I brought home four bags of roasted peppers, and they perfumed the small plane I came home on wonderfully. "I know this is kind of mean to post"
This is my first post - please be gentle with me! Seebee and anyone else who might be interested: I'm thinking of ordering some frozen chiles from a website that markets many of the products of Bueno Foods, a Hatch company whose chiles I've bought many times in Colorado. Odd name for a chile supplier - http://www.nationwidecandy.com - but good prices if one orders enough to be worth the shipping charge. At this point I think I'd buy 25 lbs (case of 5 x 5-lb) of frozen chiles, which I hope to split with one or more other chiliheads. I'm leaning toward the Autumn Roast http://www.nationwidecandy.com/Itemdesc.asp?ic=1062-3&eq=&Tp=, though the Bueno product I've used most before is the regular hot green chile. As heat varies from year to year, I've usually bought some mild to mix in when the hot is too searing for the people I'm feeding. For the fire-eaters among us, note that the site also sells an extra-hot chile. Both price and shipping costs can be lowered by ordering more product; if anyone wants to discuss aggregating a variety of items into one large order, I'd be willing to place the order and manage distribution. I encourage those interested to browse http://www.nationwidecandy.com to see the numerous chile items offered. Be sure to expand the descriptions where applicable. Practical info: I live in the east Loop, across from the north end of Grant Park, in a high-rise that has receiving personnel, and there is 30-minute free parking in front, handy for picking things up. Let me know if you want to join in a group chile-fix!